Confidence in the shipping industry has risen in the last three months despite ongoing geopolitical uncertainty, according to the latest Shipping Confidence Survey. The average confidence level rose to 6.2 out of maximum score of 10.0 this quarter compared to 6.0 in Q4 2018. Confidence was up in Europe, from 6.1 to 6.3, and in North America, from 5.2 to 5.6. In Asia, meanwhile, there was a drop in overall confidence levels to 5.8 from the 12-month high of 6.3 recorded in the previous quarter. Brokers were behind much of the increase in confidence. Their score was up from 5.2 to 5.9. The rating for owners and managers was down slightly from 6.4 to 6.3 and from 6.0 to 5.8 respectively. Charterers’ confidence was also down, from 6.8 to 6.0, although this still compared favourably with the rating of 5.0 returned 12 months ago. The survey was launched in May 2008 with an overall rating for all respondents of 6.8 out of 10.0. The likelihood of respondents making a major investment or significant development over the next 12 months was down from 5.5 to 5.3 out of 10.0. Charterers’ confidence in this regard reached a record high of 7.3. Brokers’ confidence was also up, from 4.1 to 4.9. However, owners recorded a fall from 6.3 to 5.4. Managers’ ratings were unchanged at 5.6.Expectations were up in Europe from 5.2 to 5.3, but down in Asia from 6.2 to 5.2. The number of respondents who expected finance costs to increase over the coming year was down from 67% to 48%, the lowest figure since August 2016. The figures for all categories of respondent were down, in the case of charterers from 80% to 33%. Demand trends were cited by 26% of respondents as the factor most likely to influence performance over the next 12 months. Competition (19%) and finance costs (13%) featured in second and third place respectively in this context. Net freight rate sentiment was positive in all three main tonnage categories identified, with 51% of respondents expecting higher rates over the next 12 months in the tanker market. This represents a drop of 9 percentage points on the previous survey score of 60%. Respondents expecting lower tanker rates fell from 9% to 6% this quarter. In the dry bulk sector, expectations of rate increases were up strongly from 38% to 52%, while the numbers anticipating lower rates climbed slightly to 13% from 11%. The numbers expecting higher container ship rates rose by one percentage point to 26%, whilst those expecting lower container ship rates increased to 25% from 23%. 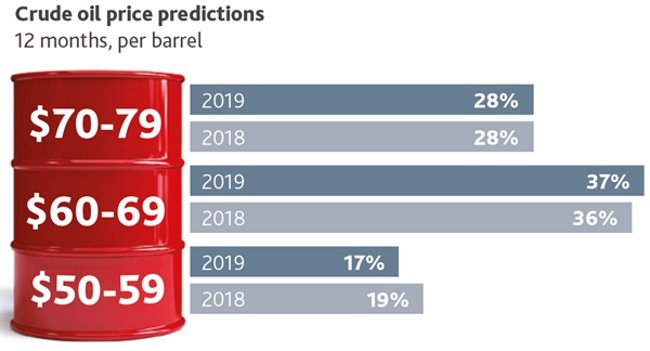 When asked to predict where crude oil prices would be in 12 months’ time, 37% of respondents opted for the $60-$69/barrel range. This figure is almost identical to the figure of 36% from February 2018. 17% of respondents opted for the $50-$59/barrel range compared to the 19% who did so last year, while 28% favoured the $70-$79/barrel range which was unchanged from 12 months ago. Richard Greiner, Partner, Shipping & Transport, says, “It is encouraging to begin the year with a small uptick in confidence. Despite continuing doubts and fears about trade wars, China’s GDP, uncertainty over exchange rates, President Trump’s decision-making, Brexit and general political instability in many parts of the world, shipping can still find reasons to be cheerful. “Net freight rate sentiment remains positive in all three main tonnage categories, and there is a growing recognition that shipping is emerging from an extremely difficult period as a leaner and greener industry. “A number of respondents noted that the financial difficulties faced by many companies in recent years have changed the dynamics of the industry, with an increase in consolidation, restructuring and mergers & acquisitions. “At the same time, there appears to be general recognition that the likes of the IMO 2020 and Ballast Water Management regulations will help rid the industry of poorly maintained tonnage and increase both the viability and the pedigree of the world fleet.